Except for the Mister Magoo version from 1965, at forty minutes this must be the shortest Count of Monte Cristo ever filmed. The main thing it has going for it is that they shot many of the scenes from the novel at their actual locations, so if you’re a fan of the book, that’s a reason to watch it. Otherwise, not so much. 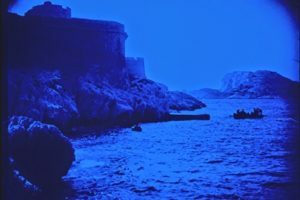 There’s time for no more than a précis of the events of the novel, but at least we get to see Edmond Dantès, in the shroud of the Abbé Faria, tossed into the sea from the parapet of the actual Château d’If.